Team Crossfit Taipan (From Left): Kirst Deveney, Lachlan Skulander, James Gunther and Jase Bennett. 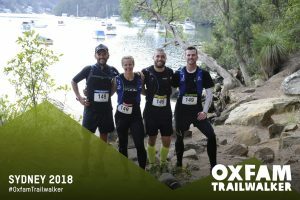 Back in July, SMA NSW Program and Coverage Coordinator, Lachlan Skulander and his team Crossfit Taipan, were preparing for the Oxfam Trailwalker- a hike of 100km. 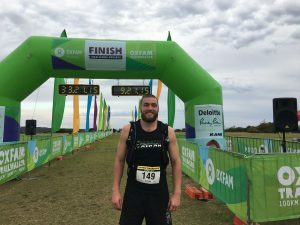 Having now crossed the finish line, Lachlan has provided an update on their epic Trailwalker journey. 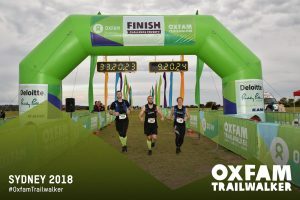 On Friday the 24th of August at 9:00am, my team from Cross-Fit Taipan (Kirst Deveney, James Gunther and Jase Bennett) and I began the Oxfam 100km Trailwalker. Having never undertaken anything of this magnitude before, I was blissfully ignorant to the physical, mental and emotional stress that lay ahead. We started at a blistering pace, making it to the first checkpoint (15.7km in) 40 minutes ahead of schedule. We continued at a good pace and made it to checkpoint 2 (27.6km cumulative distance) right on time at 3pm. At this point, out legs were starting to get sore, however we had a big cheer squad that uplifted us. After re-filling our packs and seeing some familiar faces, we were refreshed and ready to go, and things were about to get hard as the next two sections were the longest of the race. 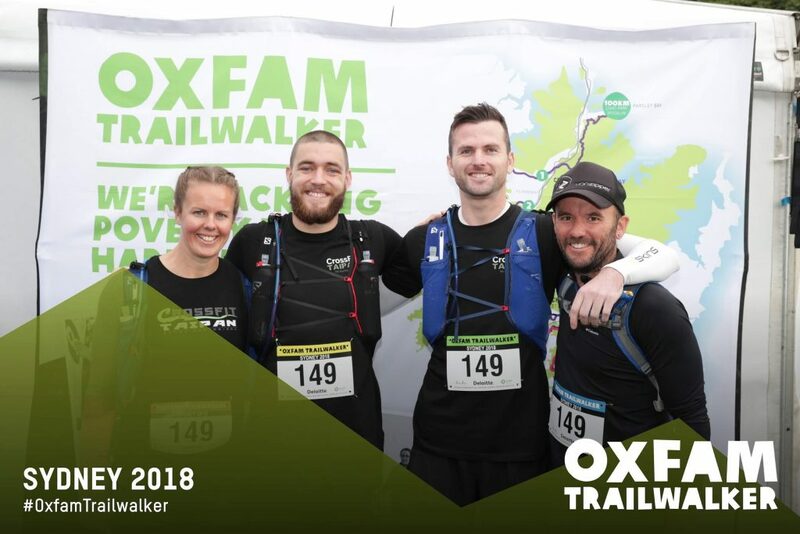 Things started to get difficult as we headed towards checkpoint 3 as one of our team members, James, started to have issues with his ITB (iliotibial band syndrome). This significantly reduced our speed and we fell behind our target time, however we kept on walking and all 3 of us made it to checkpoint 3 (42.8km cumulative distance). We decided that our new goal was to get all 3 of us across the finish line, so we took some extra time at this checkpoint, stretched, ate a decent meal and composed ourselves knowing the next section was going to be as long and difficult as the previous checkpoint. James’ injury escalated quickly on the way to checkpoint 4, the pain in his knee was so bad that we had to frequently stop, stretch and give on-the-go first aid. By this time, it was the middle of the night; everyone was cold, sore and tired. This was the most challenging part of the track for us. We made it to checkpoint 4 (58.1km cumulative distance) at approximately 3am. Here, we all received a quick massage to loosen our legs and some hot food courtesy of our support crew. Unfortunately, our team dropped down to 2 members as the pain in James’ knee became too much. Kirst and I continued, as morning broke we picked up the pace and started to jog parts of the track. We passed through checkpoints 5 and 6 (cumulative distances 70.5km and 81.8km respectively) relatively quickly and found ourselves checking in at the final checkpoint (89.7km) at 12:30pm. Although James had pulled out earlier, he was still at every checkpoint as part of our support crew. After having a few hours off his feet, some sleep and some food he was feeling much better and re-joined us as we left, meaning we could cross the finish line as a team! Through the last 10km, we battled through excruciating pain in our feet, knees and legs, but at 3:20am we climbed the final stairs up to the finish chute. All 3 of us were greeted by friends and family, which gave us enough energy to run the last 100m and across the finish line! It took us a total of 31 hours and 20 minutes to complete the entire track. It was painful, stressful and exhausting, but one of the most amazing things I’ve ever done. The generosity of my friends, family, colleagues and acquaintances was astounding! Team Cross-fit Taipan raised $2,335 to go towards the Oxfam charity. Knowing you all dug deep and donated is what kept me going and stopped me from pulling out! I cannot thank everyone who donated enough!